I have to say adult services here has been offering up a lot more than jelly doughnuts over the past few years and trying hard to get the word out. Just a few programs we do are a foreign film series, a health and wellness series in Chinese, paired programs wth the local rec department and Environmental Treasures group, earlier this month one of these programs had a talk and slide show at the library followed by a walk out to a small island accessible by foot at low tide. Still no matter how many ways or how many places we try to get the word out about all kinds of things the number of peoprl who have never heard is still huge so we just keep finding new ways to let people know. I’ve always said I’ll try everything except climbing on the roof with a bullhorn–it is slate with a wicked steep pitch! 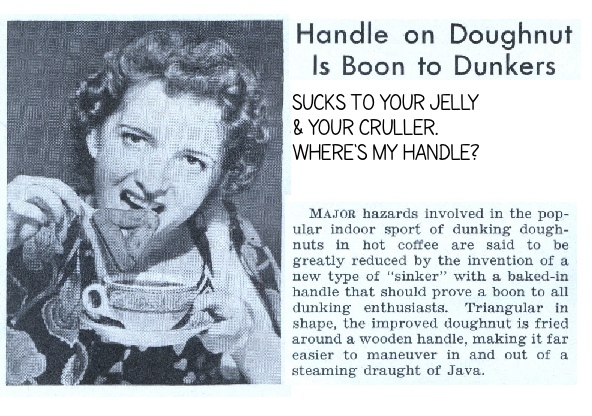 Fun fact of the day did you know that Dunkin’ Donuts actually did make a donut with a handle? It was a plain cake donut with an extra little stub to one side, they don’t make them anymore because they had to be handcut so they are harder to make. I love the quote from John Green, and I love what you have to say about it. I’m not a children’s librarian, but I am a children’s book writer, and I can honestly say that children’s librarians saved my life as a child by directing me to the cruellers, and the real hearty stuff, too. I’m writing a blog about historical fiction for children, and sad to say, some librarians feel that historical fiction is the last to be checked out in their school libraries! What’s your opinion? Do you see childen picking up Heart of a Samurai or Johnny Tremain or Number the Stars? Do you see librarians recommending histoircal fictions as cruellers? Interested in your take! There is a question about that on my blog that I’d like to pursue further.